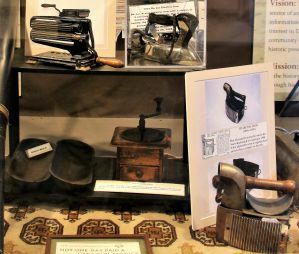 The Sandusky Street display window of The Hair Studio has been transformed into a tableau of early inventions (1800s to 1930s) designed to make housekeeping easier and more sanitary. The Society’s recent “Famous Firsts in History” program about early inventions inspired this display. Benny Shoults has again created a wonderful presentation that brings Delaware history to life through historic artifacts and photographs. The Hair Studio at 33 North Sandusky Street in Downtown Delaware Ohio has graciously made their window available the Society for several years. If you are downtown, be sure to take a look at our display. While you are there, and ask for “Steve” and thank him for the generous use of the space. For a map and directions click here. This brick Italianate-style house overlooking Delaware’s East William Street was built in 1878. It is named for William Henry Nash and his family who lived in the home through seven decades, from 1885 until 1954. The Nash House is furnished in the Victorian period with donated furnishings which have a direct connection to Delaware County. The period pieces range from an ornately carved desk crafted by OWU Art Professor Dorthea Graham to a 1928 General Electric Refrigerator. Rooms on display include the parlor, music room, dining room, gentleman’s study, children’s room, bedroom,and kitchen. The kitchen is remodeled to match the late 1930s style. The furnishings and reproduction wallpaper make this home a showplace of the elegant Victorian era. 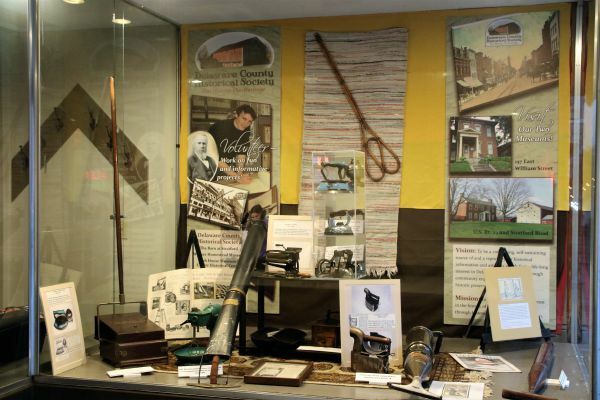 The Delaware County Historical Society is a non-profit organization whose mission is to promote, preserve and sustain interest in the history of Delaware County. The Barn at Stratford is operated by DCHS as an event venue for weddings, corporate meetings and other special occasions. To learn more, visit the event venue at barnatstratford.org and the society at delawareohiohistory.org.